Navratri is Almost Here! नवरात्रि !! I’m excited to post the first Indian Cultural Event on Filmigoris! Navratri is a traditional festival in India, celebrating Durga/Shakti as the Mother Goddess, countrywide. And fun for all of us, it has carried over into the new countries as well as the old! Often, as here in the Baltimore area, community groups like the Gurjurati Samaj of Baltimore are kind enough to welcome desis and non-desis alike to celebrate the nine day festival with them. Thanks, Tejash, for letting me know about it! 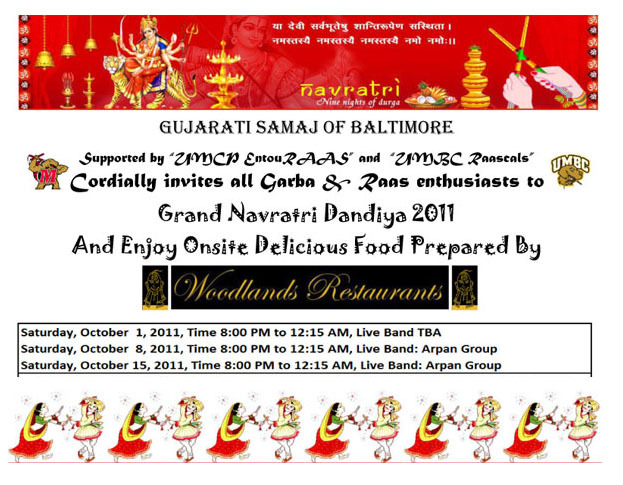 The event, the Grand Navratri Dandiya 2011, is going to be held this year on three separate Saturdays, October 1st, 8th and 15th, at 8 pm at the Meadowbrook Athletic Complex in Ellicott City, MD. The dancing will be open to the public with live music and costs $7 for members of the Samaj, and $10 for non-members. The PDF with contact information and directions is here. Navratri, Navaratri, or Navarathri (Sanskrit: नवरात्रम्; Tamil: நவராத்திரி, Hindi: नवरात्रि, and Nepali: नवरात्रि; Bengali: নবরাত্রি; Gujarati: નવરાત્રી; Kannada: ನವರಾತ್ರಿ; Telugu: దుర్గా నవరాత్రులు; Malayalam: നവരാത്രി) is a Hindu festival of worship of Shakti and dance & festivities. The word Navaratri literally means nine nights in Sanskrit, nava meaning nine and ratri meaning nights. During these nine nights and ten days, nine forms of Shakti/Devi are worshiped. The 10th day is commonly referred to as Vijayadashami or Dashera. Navratri festival in Gujarat is one of the main festivals. Garba is dance which people use to dance after the Durga Pooja with the groups and live orchestra or devotional songs. First three days: The goddess is separated as a spiritual force called Durga also known as Kali in order to destroy all our impurities. Second three days: The Mother is adored as a giver of spiritual wealth, Lakshmi, who is considered to have the power of bestowing on her devotees enexhaustible wealth, as she is the goddess of wealth. Final three days: The final set of three days is spent in worshipping the goddess of wisdom, Saraswati. In order to have all-round success in life, believers seek the blessings of all three aspects of the divine femininity, hence the nine nights of worship. Garba (ગરબા in Gujarati) is an Indian form of dance that originated in the Gujarat region. 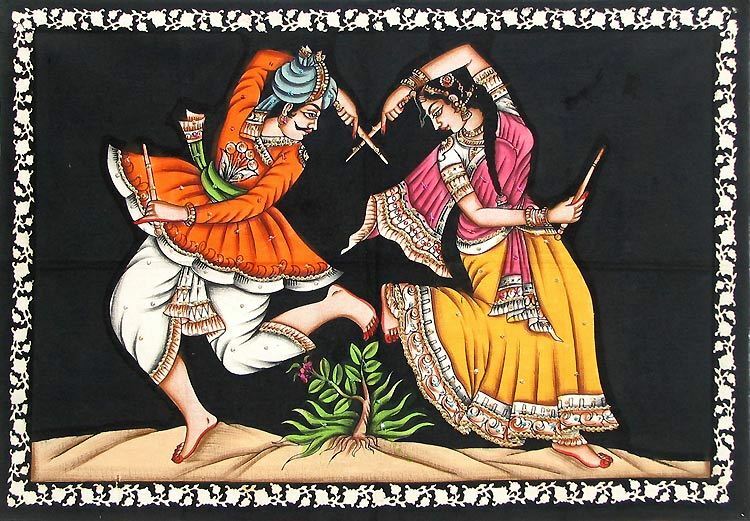 The name garba comes from the Sanskrit term Garbha (“womb”) and Deep (“a small earthenware lamp”). Many traditional garbas are performed around a central lit lamp or picture/statues of different avatars of Goddess Shakti. The circular and spiral figures of Garba have similarities to other spiritual dances, such as those of Sufi culture. Traditionally it is performed during the nine-day Hindu festival Navarātrī (Gujarātī નવરાત્રી Nava = 9, rātrī = nights). Either the lamp (the Garba Deep) or an image of the Goddess Durga (also called Amba) is placed in the middle of concentric rings as an object of veneration. Modern garba is also heavily influenced by raas (Gujarātī: ડાંડીયા Ḍānḍīyā), a dance traditionally performed by men. The merger of these two dances has formed the high-energy dance that is seen today. Both men and women usually wear colorful costumes while performing garba and dandiya. The girls and the women wear Chaniya choli, a three-piece dress with a choli, a chaniya, as the flared, skirt-like bottom, and dupatta, which is usually worn in the traditional Gujarati manner. Chaniya Cholis are decorated with beads, shells, mirrors, sitaras, and embroidery work, mati, Traditionally, women adorn themselves with jhumkas, necklaces, bindi, bajubandh, chudas and kangans, kamarbandh, payal, and mojiris. Boys and men wear kafni pyjamas with a kediyu – a short round kurta – above the knees and pagadi on the head with bandhini dupatta, kada, and mojiris. If you aren’t near enough to attend this event in Maryland, look around, I’m sure that you’ll find a hospitable group of like-minded folk in your neighborhood, willing to show you the way around your dandiya sticks… Is there an up or down to these things??? In a filmi-appropriate example, here’s my favorite, Akshaye Khanna, dancing with Suman Ranganathan as his NRI temptress and the lovely Aishwarya Rai as the spunky rival, from the film Aa Ab Laut Chalen (1999). I love Udit Narayan’s voice…Enjoy! I will never have enough jewelry to go to one of these things!!! WOW! October is beginning to be a busy month, India-wise! Kathy just sent me an email about our local Diwiali Mela that I’m posting here, too, as it seems like a comlplimentary event. We’ve attended several times in the past and it’s always a wonderful event. Lock your wallet in the trunk of your car, though…it will be emptied, otherwise. Children under 5 free, Free Parking! From Beltway, take Exit 16 (Arena Drive). As you approach the stadium, Parking Lot F will be on your right. Alternatively, take Exit 17B (Landover Rd/202 West) towards Bladensburg. Turn left at 1st traffic light (Brightseat Rd). As you approach the stadium, Parking Lot E will be on your left. navratri is festival of full of joy & happiness.we all celebrate navratri to play garba & dandiya rass.i like this festival.it is very interesting blog..
I’m really looking forward to attending the Garba this year, Chaniya Choli. Thanks for visiting the blog and come back often. Have wonderful Navratri!